Before Ikora Rey accepted the mantle of becoming the Warlock Vanguard she was a rebellious, passionate Guardian who contained intense almost unrivalled power. With no concern for dogma or etiquette that infuses the Warlock order, she established quite a strong reputation both within the Crucible and in the halls of Warlock study and scholarship. However the response of other Guardians to her reputation become burdensome and she made the choice to fly alone, scouring the planets of the inner Solar System. The Invective was her weapon of choice and an ideal solution for any problem that couldn’t be solved by wit, words or intimidation. The modified Invective maintains a self replicating magazine that always ensures that the shotgun remains stocked, out there on the frontier. 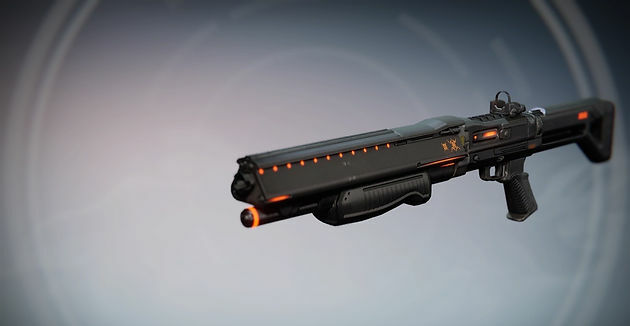 The Invective is a top tier shotgun with reasonable range and a full auto fire rate that can eliminate any opponents quite quickly without much effort. The main draw of the Invective is its exotic perk, also named Invective, which allows this gun to regenerate ammo over time. While this gun can be supplemented with special ammo drops if no ammo is to be found over the field, this gun will regenerate its ammo 4 shells at a time.This takes a short time and if you do not heavily lean on your shotgun, you will find that every time you switch to it, you will have ammo. Of course this does not work if you are constantly firing it like a crazy person. In PVE this gun has exceptional usage, with the the rapid fire rate, it is able to take down multiple enemies in a quick fashion as well as to eliminate a higher level enemy rather quickly due to the Invective pumping out four shots in the space other shotguns might get around two. However to compensate for this, the Invective has slightly less impact than the higher impact shotguns which fire much slower. It all depends on your personal preference with your weapon. In the Crucible, this gun can melt enemies with ease and the rapid shots make it harder for your opponent to aim and fire back as they jolt your adversary quite a bit. This exotic is quite the tool for any Guardians aspiring to be a force to be reckoned with. The look of this gun is beautiful as it has a sleek and finished look that players love. It has a contrasting colour scheme of red/orange and black that gives the Invective quite a menacing look that syncs with its raw power and lack of mercy. One notable thing about the gun are the symbols that are present near the trigger at the base of the barrel. The shape and design of them appears to be influenced by Hive symbols and the workings on their weapons but is in fact the logo for the weapon manufacturer which is Cassoid. Whether there are elements that have been taken from opposing alien races, either the Vex or the Hive, in order to create the regenerating magazine, it remains to be seen. The Invective can be gained from an exotic secondary engram or purchasing it from Xur if you are lucky enough for him to have it in his inventory.